Suppose we have just a rook and the opponent has just a knight close to his king. Is it possible to win this game theoretically? e.g, in the following position (white to move), is it possible for white to win? In the specific position that you mention, the answer is a resounding no. 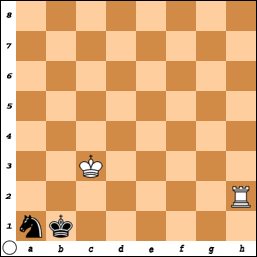 The king and the knight will defend each other, and white will not be able to force mate. However, the knight is a clumsy piece. If the knight is not positioned perfectly, then the rook will frequently be able to drive the knight to a bad square and deprive it of moves. Eventually, the knight may be captured, or the king might be checkmated. Here, white can win starting with 1.Rc2+. The plan is to drive the king to the first rank and then attack the knight while improving the position of the rook. No matter what white tries, the white king cannot approach the black king due to the knight. Black will be able to squeeze out with ...Kb2. Black's plan is to mark time by playing ...Na3 and ...Nb1. White cannot make useful progress. If white plays a waiting move, for example 1.Re2, then black must lose immediately. Any move will lose the knight or allow mate in one. If you're interested in a specific position, you can check out the Nalimov Tablebases online. They have completely solved every position with 6 or fewer pieces on the board. If the knight is close to the king, it is hard to win with a rook. That's because the knight will fend off the enemy pieces that try to approach the king. Most winning positions feature the knight and king far apart so that the opposing king and rook can pick them off one by one (checkmate the king or trap the knight). An important exception to the above is if the knight is either on a corner square, or is a "knights jump" from the corner square. A knight has only two moves from a corner square, meaning it may not have enough maneuvering room. If the knight can find a safe haven on the open board it can defend its king. A similar thing is true with a bishop and king against a rook and king. If it's a normal game, a rook against a knight will always be a draw. Do not move your knight away from your king. Be care of pins and skewers. Try to stay at the center. (Someone pointed out that you can defend a draw with your knight on b1 and king on c1. But staying near the center allows more room for error). Out of curiosity I put Stockfish 2.3.1 to work on this and it did find a solution for white to win; however it took 60 more moves. However just glancing at the results it would assume it could be done in less moves. 1.Rd1+ Kc4 2.Kb2 Ne3 3.Rd8 Nd5 4.Kc2 Ne3+ 5.Kd2 Nd5 6.Kc2 Kd4 7.Rh8 Nc3 8. 21.Kd3 Nd6 22.Rh5+ Ke6 23.Ke3 Nf5+ 24.Kf4 Ne7 25.Ra5 Nd5+ 26.Ke4 Nf6+ 27. Not the answer you're looking for? Browse other questions tagged endgame knights rooks tablebases or ask your own question. 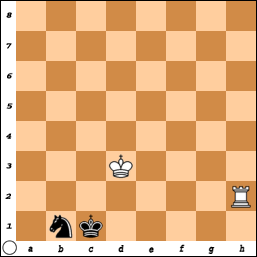 Do 5 connected pawns usually win against a rook?